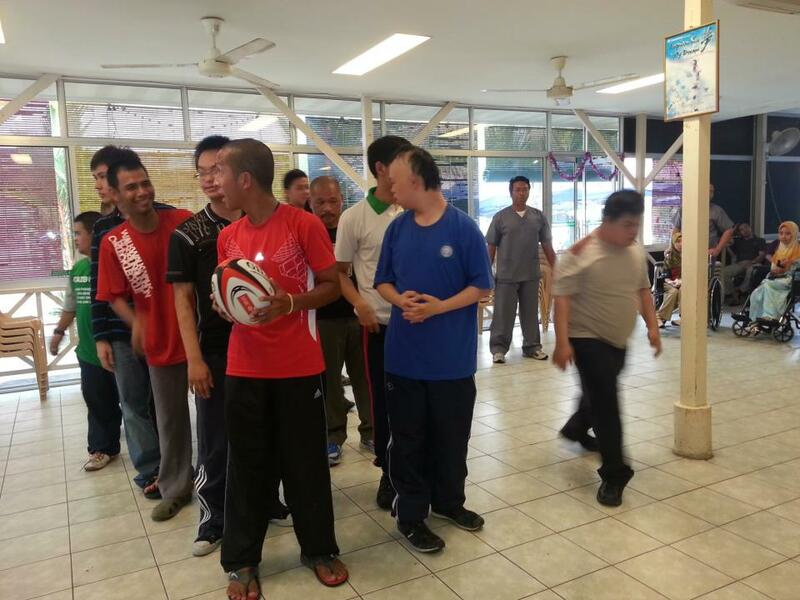 BRUNEI now has a pool of 12 International Rugby Board (IRB) Level 1 Match Officials after a dozen club and national players attended the country’s first ever Match Official Course on Friday. 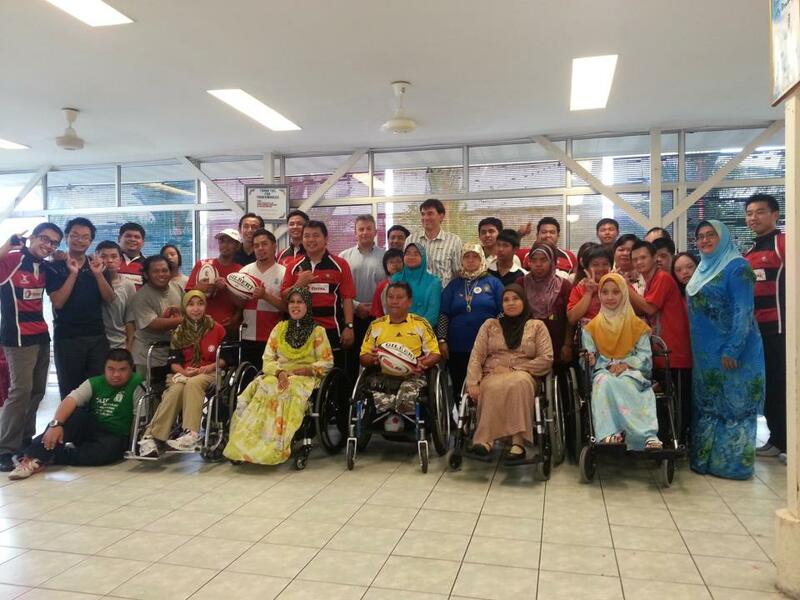 The participants were from local clubs Belait Pythons, Bandar Blacks and Universiti Brunei Darussalam (UBD) Sharks, with the one-day course taking place at the Jerudong International School (JIS) and conducted by Matthew Oakley, a qualified IRB rugby educator. The Sultanate only had two referees prior to yesterday’s course, so understandably, Oakley felt the course was a step in the right direction. “Brunei is starting from ground zero in terms of developing officials but the sport can only grow if there are willing and competent referees,” said Oakley in an interview yesterday. “There was a lot of law discussion but it was also very much a hands on, practical course, where we had role plays with the participants acting as referees and players,” he added. 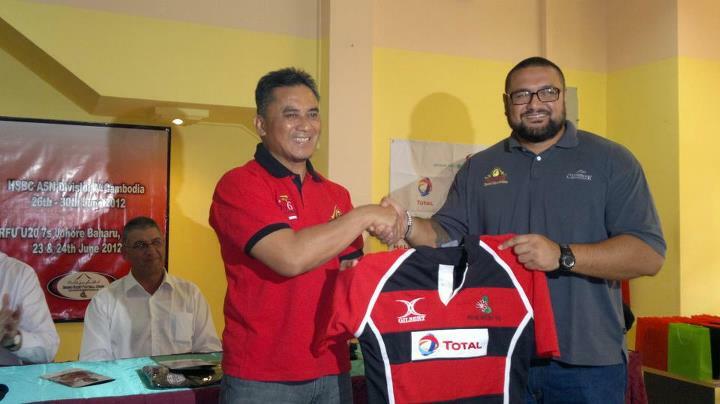 “Rugby is growing in Brunei (and) we need more match officials to officiate school and club matches in our domestic league,” said Brunei Rugby Football Union’s (BRFU) president Dr Hj Kamaruddin Dato Paduka Hj Talib. Oakley is also in the country to audit BRFU’s application to become an IRB associate member. Among the criteria for IRB associate membership include a four-club league, good governing body and education programmes. “We have been a member of the Asian Rugby Football Union … and now we believe we are ready to become a member of IRB,” said Dr Hj Kamaruddin. 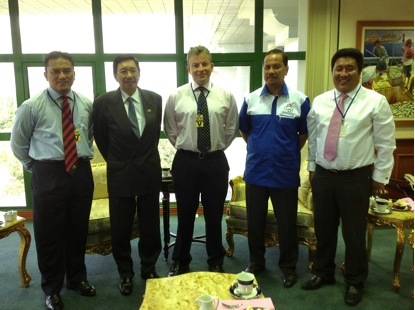 Oakley and Dr Hj Kamaruddin spent yesterday morning in a meeting with the Minister of Culture, Youth and Sports Yang Berhormat Pehin Orang Kaya Pekerma Laila Diraja Dato Seri Setia Hj Hazair Hj Abdullah yesterday, a courtesy call to brief the minister on what IRB and BRFU are doing for Brunei rugby. “We have to enhance our capabilities with the resources we have and we hope the ministry will continue to be forthcoming with more resources,” he added. Dr Hj Kamaruddin said that Pehin Dato Hj Hazair had several suggestions for BRFU, including that rugby be included in future editions of the Borneo Games, the introduction of a rugby tournament for Sixth Form schools in the country and possible areas of cooperation with the Sabah Rugby Academy in Sandakan, Sabah. He was also open to the idea of BRFU having its own rugby facility in the not too distant future. 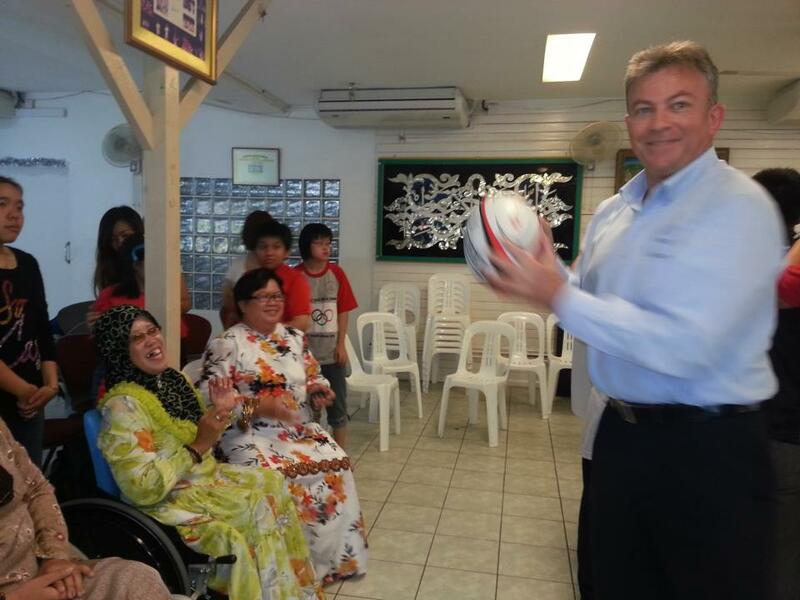 “It would be a major achievement if Brunei was to have its own home for rugby,” noted Oakley. 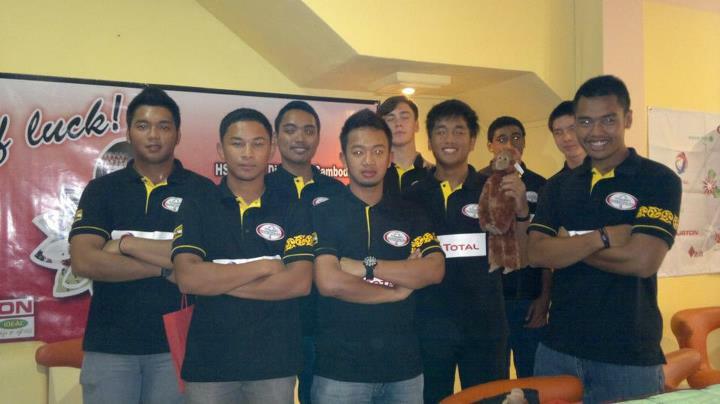 THE Brunei Rugby Football Union (BRFU) has added some new plans for the near future.Several national rugby players that recently participated in the HSBC A5N and ARFU (Asia Rugby Football Union) U20 Sevens made a visit to Pusat Ehsan in Bengkurong yesterday. 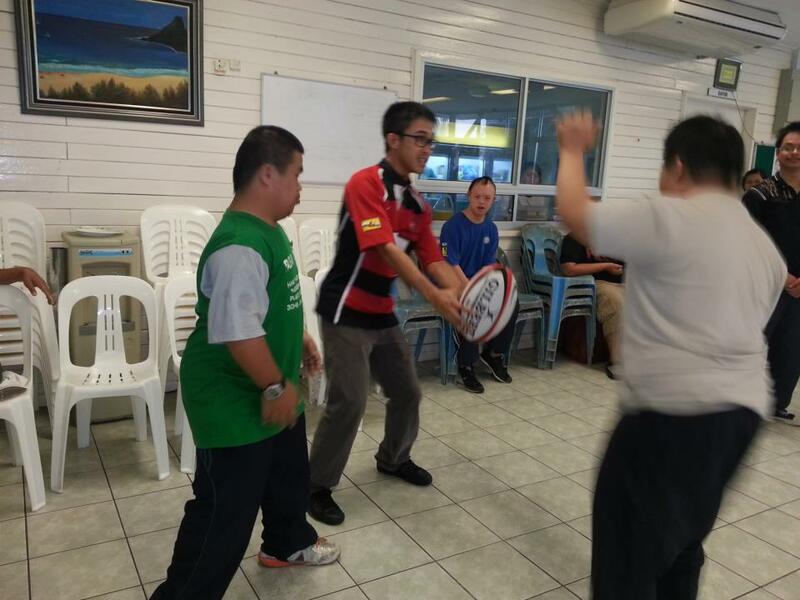 The joint-programme by TOTAL E&P Borneo BV and BRFU, will see the visits done fortnightly as they help build the motor skills of the pupils by using basic rugby movements such as catching and throwing. Forming a wheelchair rugby team in the near future and being able to participate in the Paralympics is one of the visions for the BRFU. Ainol Razman Mohd Ghazaly, BRFU Director of International Relations, is looking at the positive side and is hoping things will progress in the right direction. “This is only the start and we are working from the ground level. 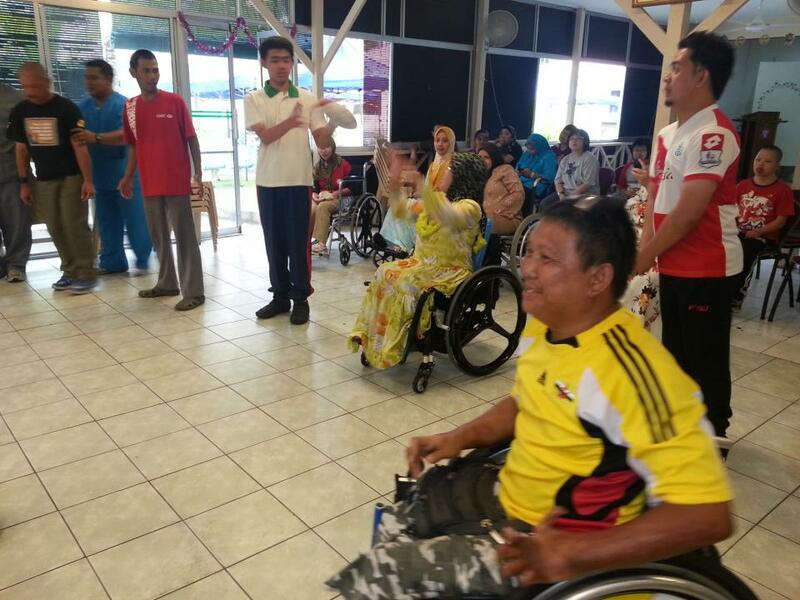 There are only three countries in Asia China, Japan and Korea that have wheelchair rugby teams in the Paralympics,” said Ainol Razman in an interview with The Brunei Times yesterday. “We will start off slowly and not force anything. We want to share the game that we love with the disabled. We are looking to build interest first and see where we can go from there before seeking support from the ministry,” he added. Considering that the BRFU is relatively new, having been setup only in 2004, they are also looking at building the sport in the country. “After seeing the pupils at the centre, we didn’t want this to be a one off thing. We will get the national players involved to help teach them,” said Ainol Razman. “We want to sell the game in a different sense. These players will act as role models for the sport and we want to continue building the rugby community whether it being as a player or a spectator,” he added. “We also hope to show the core values of rugby such as teamwork, passion and integrity whether it is on or off the field to these upcoming players,” continued Ainol Razman. Other centres which are interested in the programme can call Ainol at 8886970 or email at ainolrazman@gmail.com for more information. Jerudong International School (JIS) and Brunei Rugby Football Union (BRFU) successfully organized the first Match Official Course at JIS on the 7th September 2012. 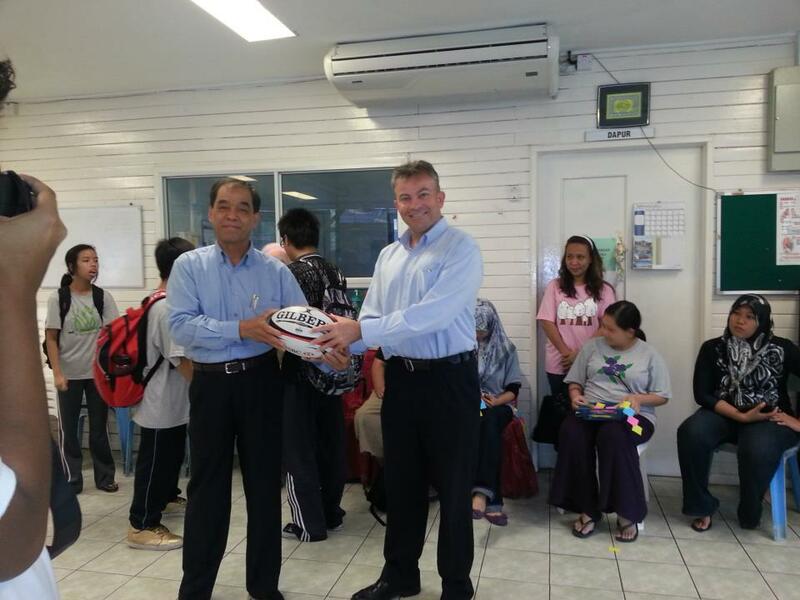 The course was conducted by Mr. Matthew Oakley, a qualified Rugby Educator from the International Rugby Board (iRB). 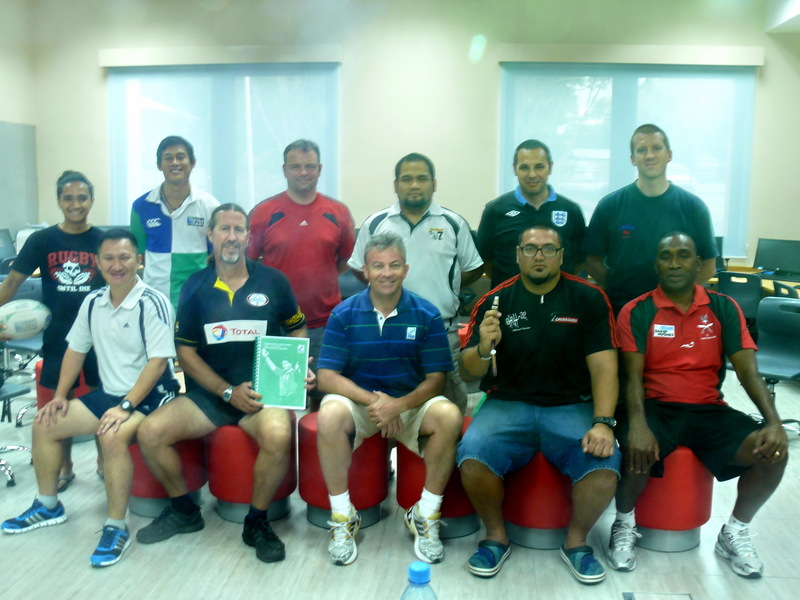 Twelve participants attended the course, and are now qualified to become iRB Level 1 Match Officials. Mr. Matthew Oakley sitting in the middle with the participants of the Rugby Match Official Course at JIS on 7th September 2012. Mr. Oakley is also here to audit BRFU application to become an Associate Member of iRB. “We have been the member of Asian Rugby Football Union, the regional body for rugby, and now we believe we are ready to become a member of iRB, the world governing body of Rugby” explained Dr. Haji Kamaruddin bin Dato’ Paduka Haji Talib. 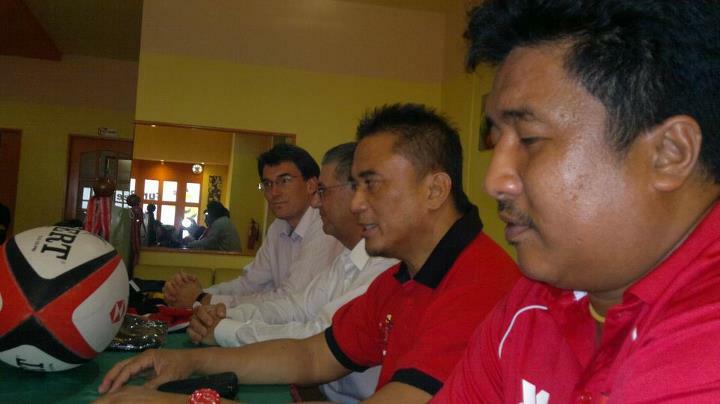 “Rugby is growing in Brunei, we need more match officials to officiate school and club matches in our domestic league. With this course, we have increase the number of match officials from 2 to 12, which is a good sign.” He added. BRFU is committed in its mission to promote rugby in a big way, working towards its 10 year long term development plan. It has established smart partnership programmes with Total E&P Borneo B.V, Halliburton, QoS, Baiduri Bank, Anti Narcotics Bureau CfBT and Pusat Ehsan. “We would like to add a more Smart Partnership Programmes with other organizations, our next discussion will be with JIS. 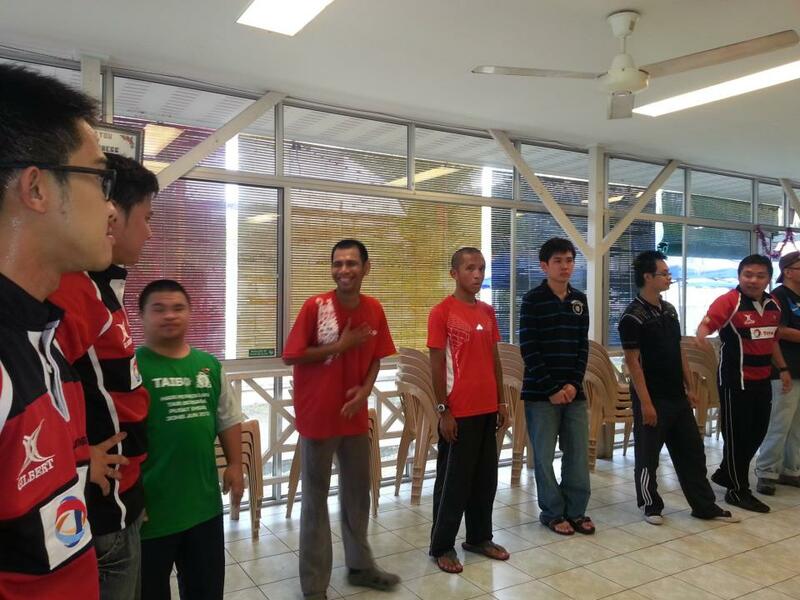 We want rugby players in Brunei to be Champions and role models in Brunei Darussalam. We will work very hard to implement our aim” said the BRFU President. Brunei Rugby Football Union (BRFU) is in search of talented rugby match officials that will carry Brunei flag at International Rugby Test Matches. 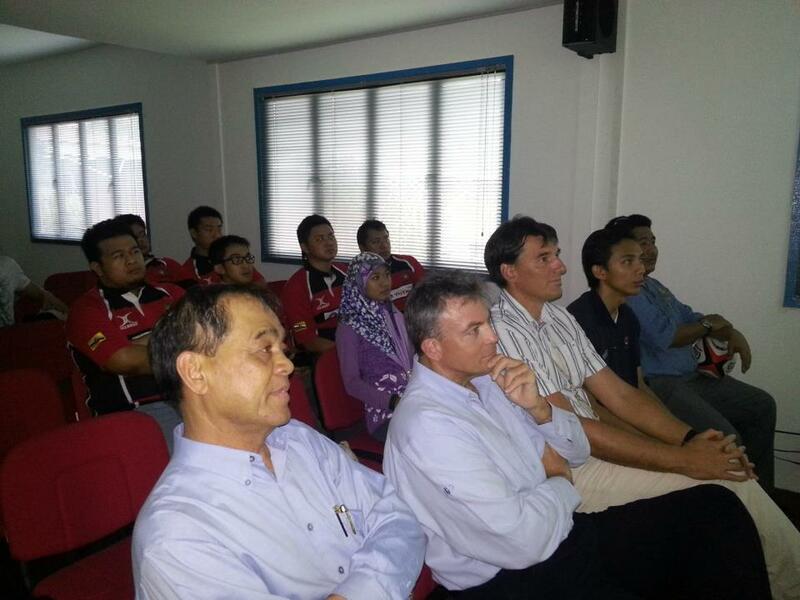 In order to do so, BRFU will be conducting its first iRB Level 1 Match Official Course in Brunei. The course will be conducted by Mr. Matthew Oakley, from iRB on the 7th September 2012 at Jerudong International School (JIS) from 9 am – 6 pm. “Rugby started in Rugby School in England and Rugby is the premier Sport in Premier Schools around the world, we would like to maintain this tradition, and this is why we would like to make JIS The Centre of Rugby Excellence in Brunei” said Dr. Haji Kamaruddin bin Dato’ Paduka Haji Talib, when ask why JIS was chosen as the venue for the Course. “Furthermore, it has all the facilities needed to conduct such course” he added. Level 1 Match official course is the starting point for one to become an official for Test Matches. To become an official for Test Matches, match official needs to sit for 2 other courses, which is level 2 and 3. Once a match official passes its level 3 course, he will be in demand to officiate International Test Matches around the World. Bruneian has a chance to officiate International test matches once they reach level 3 because of their command of English Language. To be a Rugby match official, one needs to be fit, hawk eye’s vision, good communication skills and commanding. This course is open for all, however limited there will be limited places available. It is free and lunch and refreshment will be provided. BRFU would like to thank Total E&P Borneo B.V and Jerudong International School for their contribution in conducting this course in Brunei. We thank the support of our sponsors, partners, players, and everyone who made this possible. The U20 Boys are now playing in Johor Bahru, Malaysia for the ARFU U20 Sevens Championship while the A5N squad will be off this Sunday to Phnom Penh, Cambodia for the HSBC A5N Division 5 Tournament. 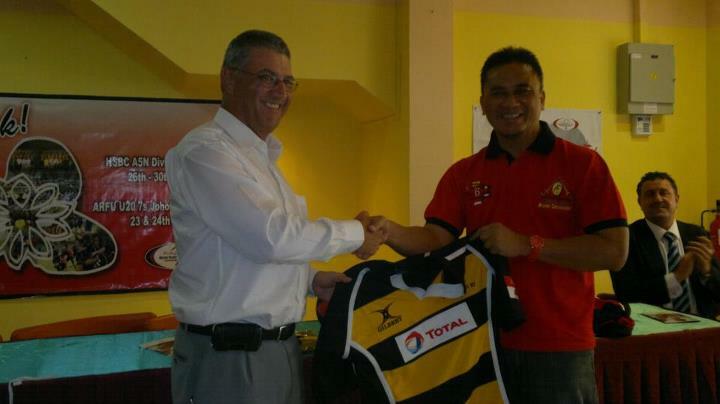 We give thanks to Total E&P Borneo B.V., Halliburton, QoS, Ministry of Education, Ministry of Culture, Youth and Sports for helping our teams to go partake for our big year in Brunei Rugby. 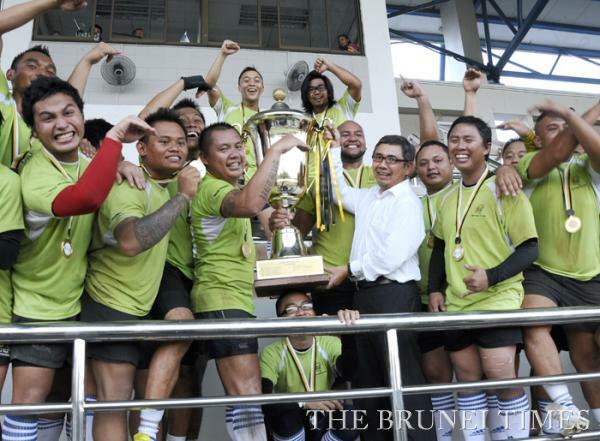 Thus ends the Brunei Senior League Rugby Tournament of 2012 with the KB Pythons emerging Champions of the Darussalam Cup again in the spectacular final! The Bandar Blacks come in 2nd Place while the UBD Sharks came in 3rd Placing. 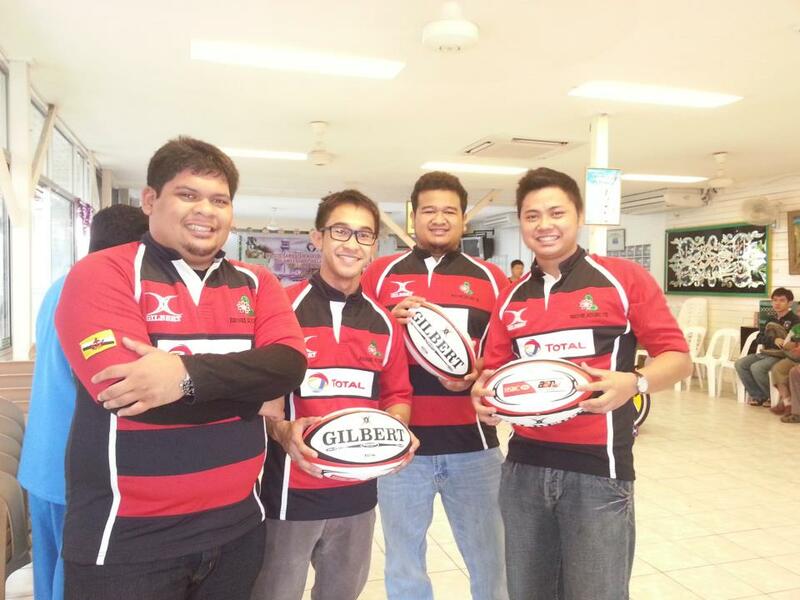 We thank everyone for supporting Rugby here in Brunei. To comment on this year’s rugby, despite having 3 Clubs participating, we saw how each of them are readily eager to win the Cup this year. From the ferocious display of Rugby playing from the Blacks, the Sharks progressing with iron will, and the Pythons, despite rough beginnings, did not surrender. This is one tournament to remember in the following years. But it does not stop here. Our boys are probably either resting up after 12 weeks of hard competition or training early to be ready for the next tournaments to come. Our National Squads will now be readying themselves for their upcoming tournaments with the U20 Squad leaving for Johor Bahru to partake in the ARFU sevens while the Senior National Team will leave for the HSBC A5N Division 5 Tournament in Phnom Penh. We wish them luck! 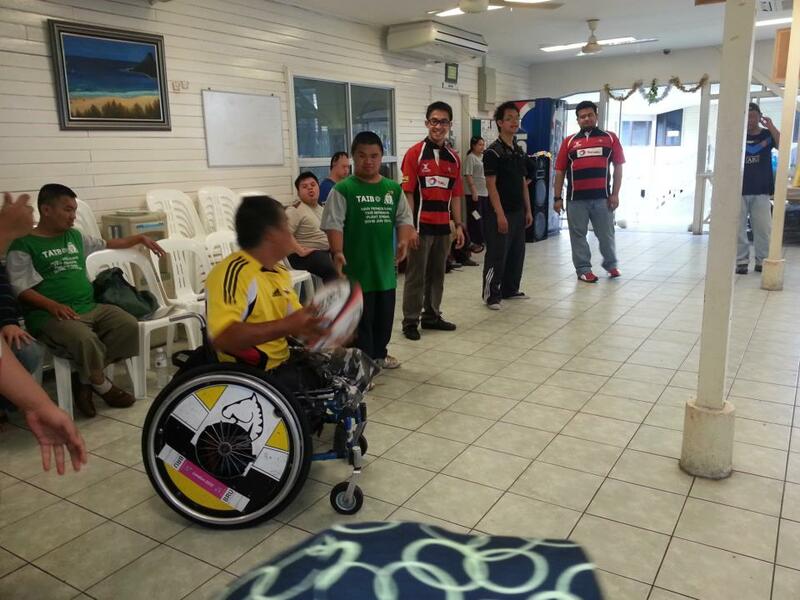 Support Rugby at its finest, read it here in Brunei Rugby Online.